Since the beginning, the One Bermuda Alliance Government has consistently used the promise of jobs for our unemployed construction workers as a major reason to support the untendered airport deal. 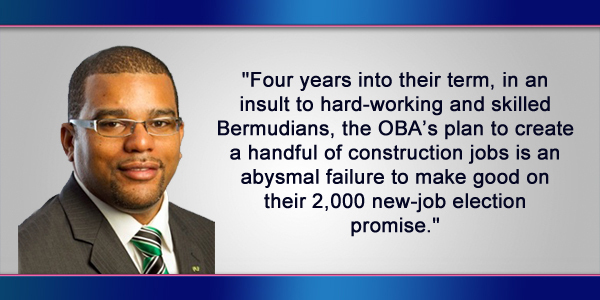 Four years into their term, in an insult to hard-working and skilled Bermudians, the OBA’s plan to create a handful of construction jobs is an abysmal failure to make good on their 2,000 new-job election promise. Not only are they nowhere near to creating 2,000 jobs, there are less jobs now than in 2012. These promises have turned up empty. Construction related jobs are declining, not rising. The Bermuda Employment brief, issued annually by The Department of Statistics, recorded 2,257 construction jobs in 2012, 2,143 jobs in 2013, 1,925 jobs in 2014 and 1,928 jobs in 2015. That means 336 construction jobs have been lost between 2012 and 2015 in a near 15% decline. Using the position of ‘Creating Construction Jobs,’ to promote the airport deal is strategically well-placed, but it is built upon a shaky foundation. The weakness of this false positioning is revealed when we look at further statistics. In response to my parliamentary questions addressed to the Minister of Home Affairs, it was revealed that work permits issued in the construction fields [masons, electricians, plumbers, carpenters, tilers and dry-wallers] numbered 844 in 4 years; 153 in 2013, 113 in 2014, 256 in 2015 and 322 in 2016. Yes, 844 work permits issued in a category that our Annual Employment briefs show have been in decline for Bermudians since 2012. The numbers speak for themselves. Not only have actual construction jobs declined, the jobs that have become available have gone to foreign work permit holders and not Bermudians. Many questions remain unanswered, such as where are all these permit holders working and do any of these 844 permits represent jobs Bermudians are more than able and willing to do? What is the OBA government doing to guarantee that Bermudians have a fair chance at those existing construction jobs that are have been filled by holders of the 844 work permits issued since 2013? The OBA is trying to justify their untendered airport deal with a Canadian company by promising to create construction jobs for Bermudians, but won’t address the indisputable fact that, as these industry work permit approvals increase, jobs for Bermudians decrease. So, is the OBA really working for you, Mr. and Mrs. Bermuda? This whole ’2000 jobs’ thing is getting beyond tiresome . It seems that a lot of people are waiting for the OBA to suddenly make the announcement that they themselves have 2000+ jobs to just hand out when in fact it is their job to provide a politically stable environment that fosters the creation of jobs. Besides, does anyone doubt that since 2012 over 2000 people have not found employment ? What the OBA should have done was slash the civil service in their first year and by this time the jobs would have been coming back, so the year on year comparisons would have been exceptional. Would have balanced the budget and killed the union which would have prevented at least 2 protests too. You are out of order, this is the two Bermudas every one talking about, I’d like to talk to you face to face, stop your dividing rhetoric, this country would not have survived, at least not as we know it today stop this nasty blogging and backward thinking. In addition the unions are here to stay, God knows what things would be like with out them. Yada Yada going get a turkey sandvich. The construction jobs promise has less to do with the OBA and more to do with business owners not wanting to hire Bermudians because they are too greedy to pay fair wages. They bring in foreign workers for their own financial gain. Businesses do have to advertise jobs to Bermudians first, but the majority of the time these business owners make the requirements almost unobtainable for the average Bermudian worker. If a business claims to not find skilled Bermudian workers then the government must give work permits to these businesses for foreign workers. If they do not they impose damaging a business owners livelihood (at least from their perspective). So really the OBA is in a catch 22 in regards to this situation. Now unlike the PLP, which often times complain about OBA policies without themselves offering any viable solutions (which a good opposition is supposed to do), i’ll offer my 2 cents on the matter and actually provide some insight into possible solutions. The simple solution is to implement training (perhaps at the college) for these Bermudians so that they can be hired in these fields. If the OBA can do this then they can make a register of all qualified construction workers, preventing business owners from falsely claiming about being unable to find skilled workers. I know the PLP doesn’t like long term solutions, but this is reality unfortunately. So lets start living in it. PS – could the opposition actually start offering solutions instead of simply picking apart what the current government is trying to do to fix our economy. Sure the OBA has its flaws, but they’re presenting solutions which is better than complaining and offering none at all. We must also implement a minimum wage in Bermuda. By not having one we are opening a can of worms for the disenfranchisement of bermudians and the exploitation of foreign workers. Also PLP, I am a university student and I’m offering more solutions that you are. Step up your game. Good governance doesn’t come from divisive and immature politics. It comes from hard work, research on a case by case basis, finding solutions together (current government and opposition) that work around economic, environmental and social constrains and implementing good policies and legislation for the greater good. Not opposing policies and legislation that are actually good just so you can have a seat in government. Shameful that someone as young as myself have more sense than people who potentially would be running our country. Repeating a tag line doesn’t make it true. Employment has increased and will continue to do so. However, why don’t we start a conversation about building careers and then maybe we will see actual longevity to employment. Give it a break PLP. You have no credibility other than race baiting! PLP – Vision 2025 – WOOHOO – can’t wait for that. Think i’ll be about 70 then. – How many out there are willing to wait for ANOTHER 8 to 9 years before the PLP do anything for you. What will they do for you from 2017 to 2025 should they be re-elected. I actually hope they do get back in. Remember their vision now. Half of you will have maggots coming out ya eyeballs including half of the PLP/OBA team. It’s your decision. Choose wisely now.